Sophisticated Cosmopolitan Flat in Heart of Urban Uptown with expansive Downtown views. This large unit was beautifully remodeled in 2018 to include a new hip private Study with glass walls and double doors. 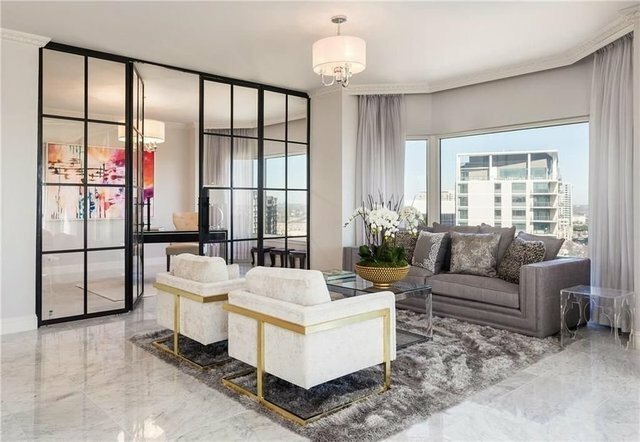 Sparkling white marble floors give clean bright look to this formal salon living and dining.A charming balcony is off the dining room and beautiful skyline can be seen from every angle. Enjoy the Gourmet Chef's Galley kitchen with plentiful lacquered cabinets, stainless Bosch cook top, Bosh oven, professional Sub-Zero refrigerator and Separate Professional freezer. For easy access a wine cooler and beverage refrig. is in the kitchen area. A real bonus is the large Family room to enjoy with charming balcony for sunset views. This large room perfect for TV/Media features a built in desk, dry bar, wine cooler, beverage refrigerator plus a long Island bar to sit at.The Master bedroom suite has a large sitting area, two walk-in closets and beautiful lead crystal ceiling fixture. A step out of Europe is the luxury bath with a Euro Jacuzzi Bath Shower. At the west end of the apartment, is a second Master suite with a luxury marble bath along with a three bedroom and separate Marble Bath.Throughout home is fabulous lighting, marble floors, Bay windows, lots of storage areas and two balconies. Most desirable is that this building is walking distance to restaurants, shops, Whole Foods, and just a trolley ride to Arts District, Uptown shops and Downtown.The beautiful La Tour prides itself in their 24-hour concierge white glove service with professional staff. Building amenities include Pool, Spa, Garden, Tennis Court, Community Room, Exercise Room.